This is a cake recipe I got from my pachi(mom’s sister). She has an amazing collection of very easy and very tasty food. One among them is this cake. The cake mix requires hardly 2-3 steps and you will have a cake with amazing taste :). This is one of the dishes she always prepared for any parties at her home. It became so popular that everybody started asking her for this recipe. It spread in her circle of friends and relatives like a wild fever. After a few days everybody was baking this cake at their home. There is a tradition in their family to send food items, mostly sweets or some other special dishes, to friends and relatives occasionally -once in a month or so. After this ‘cake fever’, everybody was finding this cake in the box sent to them. Finally Pachi was so bored of eating it, she had to stop baking this. When I started baking, I prepared this once and took it to office. Again, the ‘cake fever’ was spread in the office. Everybody who tasted the cake thought I bought it from the store and was bluffing about having baked it myself!!!. So be careful when you are baking this, you might start a ‘cake fever’ again :D.
This cake tastes great when served with vanilla icecream. PS: If you use ‘baking powder’ instead of ‘baking soda’, cake becomes a bit harder. Soak the dates in warm milk overnight (I usually don’t soak the dates since I use the seedless dates, I just heat milk and dates for few minutes or microwave them so that dates becomes soft and help in grinding). Remove the seeds. Add sugar and grind them to a smooth paste along with the milk in which it is soaked in. Add oil and mix. Sieve together flour and baking soda. Add the flour one table spoon at a time and mix slowly. Add the nuts and mix. Preheat the oven at 350F. Bake the cake in a greased oven proof dish for 35-40min (or till a knife inserted in the cake comes out clean). PS: The color of the cake largely depends on the dates used. I have made it with different varieties of dates and sometimes it turns out black and sometimes it is very light in color. So do not panic if your cake does not look exactly like mine. In above picture, I have used buttercream icing for decoration. One change I made this time is, I didn’t add oil. It was a bit less dense, but the taste was still great. So I think I will be baking the low calorie version, ie without oil hereafter. All other ingredients quantity remain same. Hi, I really want to make this cake soon. It looks great and so fluffy. Looks yummy… When can i learn to bake !!!!!! You are increasing my baking list . Thnak you for the recipe and i like to do it asap. Mika, Srikala,Lera, Vineela thanks for your comments :). Try the cake and let me know if you get ‘cake fever’. Tony, I feel baking is very easy compared to cooking any other food. Because if you follow the instructions properly, it hardly takes 10mins of your effort and while baking, you need not keep an eye :). This cake was really easy to make and tasted great! Thanks for the recipe. That’s an awfully easy recipe by your Pachi. I’ll have to try it out, maybe today itself. It will be nice for my little daughter too. MT, Vaishali, try and let me know if you like the taste. i m planing to bake this cake for vinodh’s bthday. And this will be my first cake baking..
Tina, Sudha, let me know if you like the cake :). Babi, Thanks for the comment. I don’t know if the microwave oven has made it hard. I always use oven to bake it. Please try baking in normal oven next time. Do not refrigerate the cake. One more thing is…. (I too didn’t know this before, just asked my pachi)… Use ‘Baking soda’ instead of ‘baking powder’.Â I have updated the recipe accordingly now. Great recipe, I did try your cake recipe for my engagement day, I posted the message there. It was very good, My first cake. Thanks for sharing wonderful recipes, special thanks to your pachi. Radha, Thanks a lot for the comment :). Well..I need to ask my pachi for more clarifications now. usually I dont keep any cake for more than two days. But this cake remains good for 4-5 days withour refrigerating. I don’t think wheat flour can be used for this cake. I have never used wheat flour for any cakes. So please use maida or all purpose flour. Preheat the oven for 10mins. Also…if u r using the conventional oven, use the middle rack for baking the cakes to ensure an evenly baked cake. I tried your date cake and it turned out great! I took it to be had for dessert at my cousins place but it was devoured in the first five minutes even before appetizer ha!ha! The only difference from your recipe was that i had to bake it for 50-55 minutes. thanks for sharing this wonderful recipe and look forward to many more. You are doing a great job, keep it up! ur cake recipes are great!keep it up.i wanted to try the date cake for my little one,who doesnt eat them raw.i have a doubt:when do we add the sugar?how well should we mix it?thanks. Gayathre, I have updated the post, sorry I had missed the sugar :(. Just have a look. Sugar should be blended completely with date-milk mixture.Thanks. wow!shilpa,u are amazing!i hope to stay in touch with u thro’ ur wonderful site.have a great day!! Hi Shilpa… Lovely website! My moms from Manglore who ofcours speaks konkani… I love the language i think its the sweetest language ever!! I cant speak Konkani very well though! Anywayz.. wanted to know.. wats better? shud i use Kharik (dry dates) or Khazur (wet dates)? Hi Shilpaâ€¦ Lovely website! My mom is from Manglore who ofcourse speaks konkaniâ€¦ I love the language i think its the sweetest language ever!! I cant speak Konkani very well though! Anywayz.. wanted to know.. wats better? shud i use Kharik (dry dates) or Khazur (wet dates)? Sudha, nice to know your mom is also a Konkani :). You should use the wet dates (khazoor) for this. Kharik will not go well. Wow.. Shilpa u replied so promptly 🙂 Thanks again. Will def. try this one for our jain friends coming over the weekend. Also made Eggless Banana Walnut Cake from Mahanandi’s site. Tats where I got alink to your site and m looking at it since almost 2 hrs now… getting nostalgic thinking abt my mom sitting in Mumbai! hehe. can i send u a recipe too? I think the prawn curry mom makes is also konkani style but a lil diff. If its oki by u.. i can ask for the recipe and send it to you. Its the yummiest ever!! Sure Shubha. I will be very happy to get the recipe from you. Do mail it to me. Thanks in advance :). Hey I love this recipe Shilpa. I love these no-nonsense fruit and dried fruit cakes. I have never used ground dates in cakes before, will try it as soon as i get some free baking time and shall let you know. Since I don’t use much of refined foods, I’ll be trying for the first time a mix of AP and whole wheat flour. I always bake with whole wheat flour aka simple chapati cha atta, and it turns out good. Hey Shilpa… I made this cake and it was down right yummy! soft, fluffy, simply yummy!! Only thing is it didnt look like yours! It was brown in color! Wonder why? Thanks anywayz. Nandita, I hope you got a good cake :). Shubha, I think the color might depend on dates. Also, I take out the cake when it is just done. Baking it for a longer time, might change the color. Yeah maybe the dates color make a difference! Well i too took the cake out just when it was done… exact 35 mins! So i guess it is the dates color 🙂 Thanks a lot. Next on my list to try is your Rava cake 🙂 IWll keep you posted. whether diabetic patient can eat dates? Dr Jyoti, I don’t think diabetic patient can eat dates, because they are sweet. Re: the diabetic patient post — If your blood sugars are well in control and your activity level is not sedentary- then YES you can eat dates….!!! take it in the morning and make sure you exercise a bit more on the day you take dates. But what you MUST avoid is refined sugar. i checked out your site and was bowled over by the looks of your cute date cake…yummmmy!! i got down to making it right away…..i was amazed as it came off the oven,hot,soft,yummy and light. my hubby,kids and mom in law loved it…and so did i.
thanks a lot for such great recipes. i must tell you that it looks so simple and yummy…i’m always on the look out for eggless stuff…please, can you tell me if this can be made in the micro oven cos i dont have a regular oven…. Arundati, if you look at the comments above, one of the reader(Babi) had baked it in microwave. So you can also try. I have not tried it in microwave yet. Renuka, I have no idea how much they will be in grams. But since you are measuring everything with the same cup, the proportions would be correct. This cake is usually not very sweet. If you need it very sweet, you have to increase the sugar amount. please send me the simple cakes recipies and more snacks recipie which I can make it in Micro oven. The cake really looks yumm…….and I’m going to try it out today. Just want to know if we can also make the cake with eggs, if so what would be the number of eggs to be used? i got recepi from this page.i try to create. This recipe sounds great and easy. But just one question: What is “pitted baking dates” ??? Tripti, “pitted baking dates” are dates in the form of a paste. I found this packet in a middle eastern store here. Since I was using it for baking, I thought “baking dates” would be a better choice. I have no idea what is the difference between the two dates. I baked this cake with normal dates last week and it came out very dark in color almost like a chocolate cake. It tastes very good. Tried this recipe.Came out very well.Can you suggest some more eggless cake recipes? 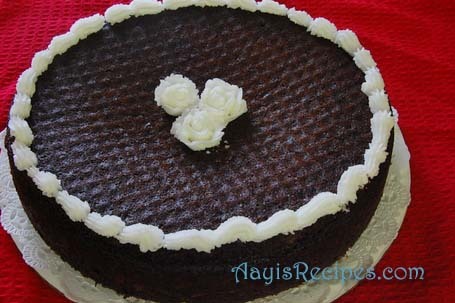 Radha Anand, plese see the “moist chocolate cake” and “eggless banana cake” under “cakes” category. I will see if I can find any more. Thanks for this wonderful recipe. I wanted to know whether I should beat in the oil with an egg beater or blend it in the blender? Thanks. Binth, use blender to blend it. That way oil gets mixed faster. With egg beater I guess it would take more time. Thanks for your prompt reply Shilpa. I tried out the cake today and it was amazing mashaAllah! Very soft, fluffy and delicious! Thanks for sharing this simple yet wonderful recipe. Oh, I forgot to mention that the baking time was barely 20 mts. for me. Is bicarbonate of soda the same as baking soda? the cake looks really good and easy to make. i have a microwave (without convection) .can i bake this cake in it? if so, how long will it take? and should i bake in full power? I have a query. I have not yet tried out your delicious cake. Just want to know if you buy the normal dates from the dry fruit store i.e khazoor you only have to remove the seeds and is it necessary for it to be soaked whole night. Pls let me know. I want to try it very urgently. Vanessa, I use pitted dates so they need not be soaked and the cake batter gets ready within 10mins. I buy these from Indian store. If you use seeded dates, then you need to soak, so that the seeds can be removed easily. I tried the cake yesterday & it was so easy to make. It came out great. Only thing had to bake it for 55minutes and used baking powder instead of baking soda. Thanks for the wonderful recipe. can we make this in a microwave and how much time do we hav to set n the microwave for it’s preparation..???? I baked this cake today with awesome results. It just melted in the mouth and was rich in taste. The best part was that it took just 15 min to put tog the ingredients. The baking time was 55 min for me and even after that I felt that the center was still soft. Should I bake it is a broader tray? I used a 7 ” dia circular tray. hi shilpa……….ur a great cook! this recipe was a hit when i tried it can u please post the recipe of real spicy hot chilli chicken. it would be great! thanks. Viji, The baking dish should not matter as far as the batter does not rise above the dish and spill in oven. This is very soft cake as we don’t use egg in it. You can try baking it for a bit more time next time. I use different baking dishes everytime, so I think it wo’t matter. Aishwarya, Thanks for trying and giving me your feedback. There is a paneer chili recipe on the site. Substitute paneer with marinated chicken (ginger-garlic paste and yogurt added to chicken and kept for around 1hr). Since I have stopped eating chicken, I don’t cook it at home unless there are any guests who specifically ask for it. I am sorry. yummy yummy date cake. Thanks for the lovely photos as well as the recipe. baking cake is something I enjoy and plan it for sturdays so that I cld keep my kids occupied. I tried this cake today. It came out yummy. The only thing is that it did not rise in the center. It was ready in 35 mins . should I have kept it longer? Also was I suppose to wait for the cake to cool down before talking it from the pan. the base was till stuck to the pan. Geeta, From your description, it looks like the heat was very high. Use the middle rack to bake oven. Also, keep the cake at bit lower temperature next time, and keep it for more time. If the cake pan was not greased and dusted well, the cake will stick to bottom. So make sure the entire pan is greased and dusted well. Thanks for your reply. Am I supposed to remove the cake when it is hot or wait for it too cool down. Geeta, you should wait till the cake is cooled down. You can also use parchment paper to cover the baking dish instead of greasing the bowl. But in any case you need to wait till the cake cools down. how can i do the caramel sauce so i can add it at the top of the cake it will get better tast . Rouia, I sencerely feel the caramel topping would take out the unique taste of this cake. This is a date cake and has a very good date flavor. If you still want, I would refer some of chocolate cake recipes for caramel sauce. i tried the cake and it was really mind blowing. it looked, smelled and tasted heavenly. thanks for the great recipe. what a rich looking cake. I am always looking for simple and interesting baking recipes. Just had a question. If I use pitted dates, I should still grind the dates with the specified qty of milk? Yes SL, you have to grind dates to get a paste. If you try to mix them with milk by hand, pieces of dates might remain. Cake looks delicious. I’m going to make it tommorrow and i have a question….when we soaked the dates in milk overnight, do we have to keep that in refrigiratior or just leave on the counter top? if we leave outside is it ok with the milk? Sailaja, I think it is better to keep it refrigerated overnight and take out around 1hr before so that it comes to room temperature while making the cake batter. If you have seedless dates, it is not required to soak overnight, just grind them with milk and it will be fine. I just bought some dates(Medjool) and will “give it a whirl” as they say… I’ll let you know how it turned out. I was looking for a new sweet to make and this caught my eye. My mother used to make a “chocolate chip date cake”. If I can find the recipe in the house, I’ll send it for you to try! i’m a regular reader of ur site.i just love reading & seeing ur recipes.for the first time i tried ur date cake.it was delicious.. but i added a mashed banana also in my cake & it was a wonderful moist cake.thanx for the recipe.c u & best wishes. I was searching for eggless cakes in Google a couple months ago when I had no eggs. I first made this cake a couple months ago using brown sugar instead of white and it was absolutely delicious. I just bought a big container of dates yesterday and plan on making it again since eggs have been really expensive lately and I am craving some baked goods. 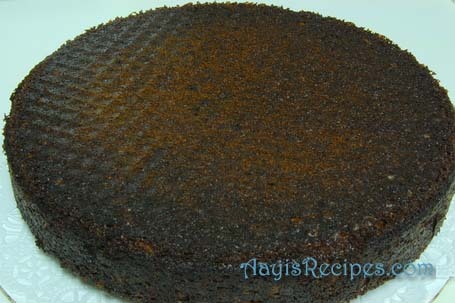 i was looking for a eggless cake ,loved the reciepe,will be trying it out today itself,it looks rich & yummy. Iwas looking for eggless cake. Its a great recipe .thanks for sharing. Thanks to your pachi too. hey! I saw ur recipe for cake ,i am a vegetarian n i just loved it. I am going to try this.can i make this in microwave oven please reply dear. i am going to post a chocolate cake recipe ,ofcourse eggless made in microwave oven in just 6 MINUTES hope u all will just LOVE IT!!!!! Kripa, yes I use the measuring cup used in US. Before coming here, I used any normal sized cup(not the small or big ones), but that is always confusing since every cup is of different size. I think in India also we get those measuring cups. Karish, yes you can use microwave oven for baking this. But I don’t know anything about it since I never baked anything in microwave oven. I am sorry. hey shilps,thanks 4 ur reply…….muchas gracias!!!!! I baked the date cake,it was yummy, my little one took it to school today with a promise that i will bake many more. thanks for the tasty reciepe. This recipe indeed deserves to be most popular post on this site. It tastes good and is a good motivation for first timers to bake more. Thanks shilpa. It was a good treat on my husband’s birthday, iam a first timer too. I have diabetis and high cholestrol in my family and have been forced to play around with this website to cater to the family. I used 1/2 of splenda rather than sugar, sofala oil or EVOO rather than regular oil and regular roti flour. Also, we are no veg’s so I added one egg white for fluff. Date cake has become my hubby’s favorite cake. He wants me to bake every week. I also made Vermecillie upma the way you told in your website. It was super hit in my house. Every weekend my hubby wants that upma… Thanks allot shilpa. Shilpa… I was waiting to be the 100th to comment on this cake. It is a super hit in my home and neighborhood too. I will be baking it for the third time tomorrow.A hat rick,continuously baking for 3 days. My comment on it would be “It is the BEST RECIPE on Aayisrecipes.com” Thanks to you and pachi for it. I now believe in the cake fever. Thanks a lot for such wonderful recipe…My toddler n other friends loved this cake..its a big hit! Dear Shilpa…The cake fever is on in my apartment complex here. Everybody is baking this cake. Once again this is the BEST on Aayisrecipes. Please thank pachi on my behalf. I am Deepa from Belgaum, recently moved to US…first time commenting on your blog. Just now baked this cake(My first ever baking experience) and it is fabulous!! Hubby and me loved it very much. Thanks a ton for sharing this great recipe with all of us. I just read in one of the repies somthing about diabetics and dates. At present we know much more about what diabetics can eat. The answer is everything but with care. A test indicated that sugar(!!!!) is as fast enterred in the bloodstream as potatos! You need a food table and then replace some of your food with something else that has the same content in carbohydrates. Take smaal amounts at a time. After all a bite of cake tasts as nice as the whole cake. My wife is a insulin dependent diabetic and she can eat whatever she likes but in small portions. Obtain a bloodsugar measuring instrument and test your blood frequently and certainly when you try new foods! Success! Last week i tried out your eggless date cake for a party where all of them were vegetarians. It turned out amazing and it was all almost finished with just a piece remaining for me to taste. One of my guest commented that for any potluck parties in future, I should get the eggless date cake. I baked your cake this weekend and it turned out to be perfect. I have never baked anything before and it was so easy :). I was wondering if reducing the sugar quantity would affect the consistency of my cake since I like my cakes to be a little less sweet. Thank you for your super duper recipe and please keep posting recipes of eggless cakes and I will continue baking…. Looks great recipe. Is Baking soda is soda what we use for idly and Dosa. Please reply me I want to try this recipe. Yes Neha, its the same. I discovered your website by chance yesterday, when I was looking on the internet for a good way to use some gherkins. Then I came across your date cake recipe- and the result was fabulous (certified by my husband). I had a batch of dates that were not so good , and I did not want to waste them, so I used them in this recipe. Note: I only baked my cake for about 25 mins and it came out fine. I probably used too large a baking pan (I had only this one particular square one in my baking cupboard!). I will be a regular visitor from now on, and I am a blog reader, though I don’t have one of my own yet. Thanks for your wonderful recipes …..and thanks to your aayi and your paachi! Hey, Could you pls. tell me if you used maida(as sold in Indian grocery store) or “All purpose flour”. Once I tried maida for a cookie recipe that called for “All purpose flour”. and it was not so good. Also, could you pls. specify which oil you used b’cause I use peanut or olive oil for most of my cooking. Shama, I use all purpose flour here but in India I used maida always. You can use peanut oil. I used sunflower oil or vegetable oil. Shilpa. I recently came across your site when i was searching a recipe for Pani Puri and since then I have been hooked on to this site. Today I tried the date cake. It turned out nice. I baked for 40 min but it was burnt at the bottom. So next time, I’ll bake it for lesser time. This cake looks very nice! Is it okay to use hand blender to mix the dough? This cake looks great.I am new at baking but I have a question that can we grind the dates with the milk in which they were soaked or just take out the dates and grind them with sugar and oil?And than add 3/4 cup of milk in it? You mentioned above that “Add the flour one table spoon at a time and mix slowly.”but could you please tell me where to add flour..(hopefully to the date mixture). Milli, yes you can use hand blender. Sia, yes, you have to grind the dates in same milk that you used for soaking. Yes, add the flour to the date mixture and mix. I have one more question..what kind of material it should be before putting in oven..means it should be of what consistency…semi solid..semi liquid….as I am new at baking..I would appreciate you answering this question. No more questions now..I tried this cake and it turned out a great cake but I needed 55 minutes.My husband and daughter like it so much.. Thanks a lot for such a simple eggless recipe..Do you have more eggless recipes than please post(other than eggless banana rava cake). I baked this cake again yesterday and it turned out nice. This time I baked it only for 30 min because last time when i baked it for 40 min, it was burnt at the bottom. Wonderful recipe! Fills the house with great smells, can’t wait to taste it at a party tomorrow. Thanks. I made this cake and it turned out very nice 🙂 I baked it for 25 mins on middle rack. I am planning to bake this cake tomorrow. I do not have a mesuring cup with me. Can I use a cup which I have and add the quantities and per urs. Should the amount of dates be less than the flour. Please clarfy, so that I can come out with a sucessful cake tomorrow. Shilpa: Uma, sorry, I can’t answer this question. You have to do trial and error :(. Ur Cake baking skills and pictures have tempted me to the extent of buying an electric oven! I did purchase one yesterday, hv yet to buy the accessories! I wd try this cake first. pre-heating time — i m a beginner in baking( ur mail inspired me to get into baking and give it a try), hence a query which might sound foolish to u.. I shall follow the middle rack baking tip and read comments more carefully for any help! Thankyou and ur site for making cooking such a pleasant and happening experience…not to forget the varieties!!! Finally the day came and it was today, my first attempt wt electric oven to bake this super-moist and delicious cake! it did come out real gud for first timer like me, but the top coating got burnt..maybe 180 degrees in electric oven was too high…but no afsos!Tks a ton..and ur Gurudakshina is coming by mail! Shilpa,date-cake fever has started here now!dates we get here r too gud & best 4 this recipe! (electric ovens emit lot more heat than a gas oven-same goes for baking done in combi type of microwaves!hv 2 really chk every 10 mins)made this wonderfully moist & moderately sweet cake 4 second time!tku 4 postin it!! Hi Shilpa… tried this date cake & it came out well (Soft& fluffy). i would like to know if baking powder can be substituted with baking soda in all cake recipes if the former tends to make cakes hard..?Also, i would like to share some of my recipes thro’ your site…where do i mail them to& is it ok?do reply soon. bye. Shilpa: Roopa, its always better to follow the recipe as it is. It is not a good idea to replace baking soda with baking powder or vice versa. Sometimes it turns out good and sometimes it totally messes up the dish. Please mail me at aayisrecipes AT gmail.com. I will try out the recipes here and then post them. Thanks a lot for the offer. I tried the date cake yesterday…by the first method. It turned out very well and my mother and in laws enjoyed it a lot…It has been 7-8 years since I baked an eggless cake..!! I have one question about the recipe…just wondering if a touch of vanilla would be good, since I could smell the baking soda..
Shilpa: I don’t recommend adding vanilla as it might change the aroma/taste of dates in it. But you can give a try if you like. This cake was long pending in my to do list from your blog.I had very high expectations after reading your post and all the comments. I got a very nice cake,perfectly baked(30 mins).Mine looked so much like a chocolate cake and can be mistaken for one.I asked my hubby to guess.He was fully confused what cake it was(cos of the taste) but the only thing coming to his mind was chocolate cake. this receipe looks good, i wud like to try it soon. But i hv a small problem i dnt hv an oven. Is there any other way I can bake the cake. I have heard that cakes can also be baked in some other way (i think … not sure). Shilpa: Bharti, cakes can also be baked in cooker. But I have never tried it, you might have to search on the internet. Wonderful wehsite.I’m a vegetarian and while searching for eggless cakes I entered this page.I was very excited to read your recipe of dates cake and all wonderful comments posted about it.All these prompted me to bake it very soon.It was the first time I’m making a cake and I’d no idea about the consistancy of the mix.I followed exactly all your measurements but I could fell the mix tight. Since I’m new to this I did not add extra milk also. I put it in the oven at 180 degreeC and after 10 min I felt a burning smell and checked the center and it was not baked. It took 35 min for the center part to bake properly.But very sad to say outer portion had turned to charcoal. What is the reason for this to happen? Was it the consistancy? Please give me proper advice. I do’nt want to give up. I will try till I succede. Please give me a prompt reply. thanks in advance. Shilpa: Padmapriya, if you have followed the recipe exactly, the batter would be fine. Don’t worry about the consistency. I feel the temperature of the oven was too high. Next time, keep it low and try. I have visited your site several times. Real good work & patience for all the details & Photographs. Tried out your Date Eggless cake . Must say a great recipe & spl thanks to your pacchi. The cake disappeared in 1 day flat!! Passed on the recipe to a few around. Got to know a few more blog sites thru you. Thanks. Tried your Date Eggless cake, it was really wonderful. The receipe was so easy, my daughter who is 12 years old, actually she did everything and was very happy that she did something first time and came out great. I have recently visited your site and got many easy receipes. Now looking forward to have mango eggless cake, if you have any receipe please let us kknow.. Tried your eggless date cake and it came out beautifully. It tasted very good too. Thanks for sharing the recipe with us. Do you have any recipe for eggless brownies??? Padmapriya again.Again tried the cake by reducing the temp. to 160C for 35min by preheating for 10min. This time it was not that bad still the outer portion was completly burned. I cut apart the outer portion and used the inner portion. It was very tasty and soft. I think again the temp was high. My oven is INDESIT and in the catalogue baking temp. for raised cakes is mentioned as 165C for 35-40min and preheat time as 15min. How should I set the oven when I bake next time? What does it mean by raised cake? Is this a raised cake? After taking out from the oven when can I take it out from the baking pan and cut the cake? Shilpa: I think by raised cake they mean the cakes which rise too much (this cake does not rise much). If there are many racks in your oven, use the middle one (if only two racks, use lower one) for baking next time. Also after 20mins, open the oven and check if cake is done. If it is done, remove it immediately, otherwise keep it in oven again(you might need to do this till you know exactly how long you need to bake and on what temperature). The cake should cool to room temperature before you can take it out off the pan. Tried your very unique, healthy and tasty cake for a small get together. Everyone loved it! Being a veg, we dont get enough recipes for baking items and if so, they are loaded with unwanted calories/fat. This one is very good. Only change I made is added 1/2 tsp baking pd and 1.2 tsp baking soda. Also added 24 dates and reduced the sugar by 1/4 cup & it was perfect. ONLY problem I saw was , the cake was not cooking from the inside and it took almost 1hr 10 mins to cook the inner part, one good thing , the outer was not bad at all and it did not burn out..! Looking forward to more interesting healthy recipes. Shilpa: Sandhya, what was the temperature on which you baked it? Also, too many dates might have made it more softer from inside. The temp I kept was the same Preheat for 5 mins and then 350deg F . I get your point on the no of dates added. But if I would liek to reduce the qty of sugar and add more dates how should I adjust the cake to get the right consistency. I guess the inside was not done for even after 45 mins of baking. Thanks Shilpa and I love your sundried entries, I want to try them soon.. Waiting for the long weekend. is the baking soda the same as we use to add in the idli and dosa batter ? please to clarify? I have baking dates. I am not sure how to substitue the ingredients in the reciepe. Can you help me with that? Can’t wait to try it. Shilpa: Stacey, last time when I tried the cake with baking dates, I used about 15 dates and cake came out well. It was just an experiment since I didn’t know how to substitute. But the cake was yumm. the cake sure looks yummy and I can’t wait to try it. I’ve one question. As u mentioned that we’ve to soak dates in warm milk, so while making the paste, should we also use the milk they were soaked in?. Shilpa: Yes Erum, you should use the milk in which it is soaked in while grinding. Ur cake recipies are v.simple n amazing.In fact i was searching for simple cake recipies,coz im just a beginner in baking..so wntd to try out somthng easy for d 1st time.Ur easy cake recipies hav inspired me alot n m v,excited to make one. i had a query n needed some clarification.- U said its better to use baking soda 4 dis recipie.N baking soda is d one that is used in Idli n dhoklas ….rgt. Furthur, rgt nw i do not have baking soda….so can i use “ENO” powder as a substitute for baking soda..? (this question actuly came to my mind coz in many dhokla recipies that iv read,it was mentioned that u can use ENO also instead of baking powder .. So can it b used for this cake also ..pls lemme kno. N thnks 4d gr8 recipies..
Shilpa: Thanks Meenal. I have never seen any cakes with ENO. So I don’t suggest using it. Thnks for ur prompt rply.I wud definitely try out d cake.Also Wud like to see many more simple cake recipies frm u.awaiting the same. This recipe came out *perfect* on my first try. Thank you! Sidenote – I used a loaf pan instead of a cake pan. I also took it out of the oven after 40 minutes. When I stuck the toothpick in, it came out clean but wet. When I tried a piece just then the cake was a little over-moist, but once the cake cooled it was *perfect*. If I had left it in the oven too long it would have been too dry by the time it finished cooling. Just thought I’d share. thanx.il try it …can u send it to my mail addresss..
Hi shilpa! I just found your page researching for so recipies, but it is great! thanks a lot for this nice loving page! i have tried this one at home today and it worked our perfectly!! it tastes so nice and it is so easy to make! This Date cake recipe is jst so good. Today is my Hubby’s bday and I thought of baking a cake for him. The cake turned out jst perfect. (I made a cake for the first time.) Thanks for ur perfect recipe. Thanks for making such a wonderful site. Im njoing baking ur varios cake n othr recipies as theyr comin out really well.. So cant wait to bake this yummy date cake. Shilpa: Meenal, I don’t know what is the difference between two. But as I mentioned in the “Update” above, when I baked this for the second time, I used normal dates. The taste/texture was better than the first one. Also,in appearance,these pitted dates r moist n similar to our normal dates..but seedless..
Niways..i canot wait to try ths cake so il soak these pitted dates ovrngt(as u sugest for normal dates) n chk hw d cake turns out..
Wud u suggest soaking them..or i shd directly use them…. Shilpa: Meenal, when I said normal dates, I meant both pitted ones and the one with seeds. Both have same effects. With pitted, it is fast because you need not even remove seeds. I always buy pitted dates here. Ok Shilpa….Thnks for the info.. Things are now v.much clear in my head..
(Thnks for ur patience..in answering my queries!! )..Il bake dis cake soon n let u kno.. I did the cake and taste great!!!! !I did it in the microven.And takes just 4 to 5 mins. I made the cake and taste great!!! I made it in the microven in just 5 mins! I baked this cake rgt nw….n its turnd out really amazing.. I liked your Date and Walnut cake,it turned out to be very nic.But one suggestion is that whenwe soak dates in milk the dates absorb the milk and when we combine the flour the batter is very thick so i added some water and made it of pouring consisenty it turned out very very soft and nice.Thanks.Add some more eggless cakes recipes or give alternate for eggs in other recipes.BEST REGARDS.Divya. Hi Dear.Thanks a lot for the recipe.Looks Yummy.Will surely try this one for my husbandÂ´s birthday which happens to be tommorow and will surely let u know as to how it came out. Thanks once again.Take care. The cake came out too good. I had made it for my husbandÂ´s birthday yesterday and like u said, everybody thought i had purchased it from the bakery. Thanks a lot once again God Bless U.
I tried this recipe tonigt as I am taking my daughter out to a petting zoo…its come out so moist and so soft. Its almost as if its restaurant bought….I took the liberty of adding some teeny weeny sliced bits of dates so its reminding of me the plum cakes i used to have when i was little, from a bakery near home!!! Awesome. Do you hae more options of eggless cakes? WE ALL LOVED THIS RECIPE!!! Thank you so much! After a long time i baked a cake successfuly. And i can’t believe it was so great even without eggs!! The cake looked superb and tasted amazing and was nice and moist. It rose perfectly. Thank you! Thanks for the wonderful receipe! This cake was my first attempt to bake anything, and it turned out absolutely delicious! So much that in just one day there were not even crumbs left. I’ve saved this receipe to make again and again! i tried this recipe the frst time i saw it n it came out fantastic. the walnut n dates combination is gr8. i just had to use a little more milk to get the right consistency n then all was fine. thanks n wud love to know more of eggless cakes. Thanks for the wonderful date cake recipe. I adore this simple, yet delicious cake. Thanks again for the wonderful array of recipes in this blog. First time I tried the Cake and it was just yummyyy:) Thanks a lot for this wonderful cake recipe. I think since I learned this recipe I’ve made the cake almost ten times. It’s come out amazing each time. You were right – it did start a date cake craze! The recipe is so easy and the cake is so tasty. I made a couple loaves last weekend and the kids who ate it didn’t know it was even date cake. They thought they were eating chocolate brownies! This cake comes out wonderfully tasty and I’d like to bake it for large gatherings but I’ve tried doubling the recipe a few times but everytime the cake is either overdone or underbaked 🙁 Do you know what would be the baking time if the recipe is doubled?? Tried making the cake today. Half of it was gone immediately after i took it out of the oven. Its not even cool yet. i tried ur cake its fabulous.thank u.can i make this cake with wheat flour? keep in touch and send me more good cake recipes. Shilpa: Sorry Chandra, so far I have not tried any cakes with wheat flour. Will post them whenever I try. There are many cake recipes on the sites under “cake section”. I tried to make a maida cake. I did not use dates, but just used some chocolate. Initially the cake seemed to rise up, but after about 15 minutes of baking, it just went and became so dense as though all air was deflated out of it. The center part was still moist and not fully baked, but the outer edges started becoming hard like a Candy. Why is this so? Would I have put in extra baking soda? When you say “1 cup of maida”, what is the exact measurement? Shilpa: Vijay, you cannot just replace one ingredient in a cake and expect it to work fine. Any cake needs some amount of leavening agent. Dates give the cake required softness and taste. 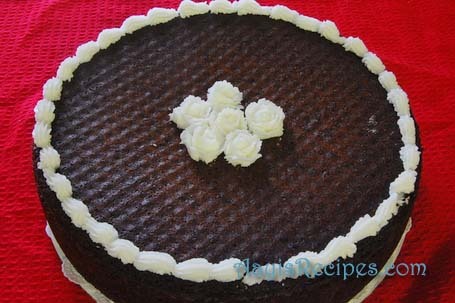 If you want to make a chocolate cake, pick up chocolate cake recipe, do not modify any recipe. Definitely this recipe will not work out if you leave dates out of it. Measuring instruments for baking are easily available in any grocery stores in US (I am sure they are available in India also). These include cups and spoons. Using these ensures you get exact measurement every time (that is the most important thing for any kind of baking). My all measurements in this blog are measured in those measuring cups/spoons. Thanks. I’ll try that recipe. Just one more doubt. What should be the consistency of the dough? Can I say that it should be similar to our idly batter consistency? Shilpa: Vijay, it again depends on the recipe you have chosen. Some are pretty dry and some are of idli batter consistency. This cake looks so simple & great. I am surely going to try it soon. I had tried this once and absolutely loved it. we now get a “date syrup” or date paste kind of thing in the market. do you think i can use that. have u tried? Shilpa: SL, I used paste once and it was pretty good. But since I didn’t know the exact measurement, I used my “andaz”. I still feel the actual dates give best results. I haven’t used Syrup any time. Tried your cake yet again. stuck to the recipe (used regular dates soaked in milk). have posted it in my blog. thanks for such a wonderful recipe. this one sure is a keeper. i really love to try out cake at home. but the problem now is, i am in a rented house with another family, who do not allow me to use the oven. So, sometime back i had heard that u still can steam and make cake. is it correct??? can v make cakes in any other way, without baking it in the oven??? please let me know. Thanks and really the date cake sounds great. I am from Ankola now residing in Australia. I have browsed your website many times but could not leave my comments. Chupke Chupke 🙂 I prepared many of your listed recipies. All that i have tried have come out well. Today I prepared Dates Cake for the second time. It has come out wonderful. Thanks for this wonderful website. Keep Going, Cheers! I reached your website while searching for eggless cakes recipe on google. Actually I am a nonvegetarian , but one of my friends is a Tamil Brahmin and hence he generally misses out on my christmas cakes. This year I wanted to surprise him. I tried your recipe yesterday for trial. And it came out very well. I made a small variation. In place of dated I used about 3 tablespoons of lion date syrup. Thanks for the recipe and this wonderful site. I tried it out this weekend and it turned out to be an instant hit in my family …. Planning to try it again this weekend … I used a cooker instead of oven and it came out very well. Shilpa: Sugan, please can you explain how you made it in pressure cooker? many people have asked about it. It would be a great help. Thanks. It looks great and tastier, as I lovvvvve cakes. Can i try this cake in Micro oven which has option to bake the cake. Please let me know as I have party at home next month. Shilpa: Yes you can use microwave with baking option. i have tried a similar cake many times. but i tried this recepie as i wanted to make it eggless. n i used baking soda instead of baking powder as u mentioned. n the cake did not rise at all. it got cooked like a sticky fudge. one more thing do u not use vanilla essence i put 1 tsp of it. it didnt not turn out very well. maybe next time. Shilpa: No Brin, I do not make any change in the ingredients when I bake this. It works fine when it is followed exactly as mentioned above. This is a dense cake, sot very fluffy. I made this cake. It came out really very good. Thank You for posting this worderful recipe. Wish you a Happy Chirstmas. i tried the cake & it came out so well that i can’t tell u.
everybody in my house including me liked it. my husband requested me to prepare it again. the best part is it is eggless so i can prepare it anytime. looking for such more recipes. This cake is fabulous!!!! !I was skeptical before trying it coz’ most of my eggless cake trials have been a failure but this was was easy and came out really well.Thanks a lottttt!!!!! hello i make this cake now and its verrry delicious n yummmmyyyyyyy. ITS VERRY GOOD AND VERY TASTY SERIOUSLY I CANT’ EAT THIS TYPE OF CAKE BECOZ ITS MADE BY ME. Shilpa: You can use vegetable oil or peanut oil or sunflower oil, so far I have tried these three and all were good. Cake can be made without butter also. I tried both recipes and they came out very well. I tried this cake today and it was simply superb..Thanx for the recipe..I am posting it in my blog today, hope u dont mind..
Looks great? Can I use coconut milk instead of milk? Because my son is allergic to regular cow’s milk. Shilpa: You have yo try it Veena, I am not sure :(. Sorry. How much is 1 cup exactly? I mean what size does it correspond to? Shilpa: 1 cup flour is 125gms in weight. I have used thee US style measuring cups. So you can find the equivalent easily in grams. I tried this cake for the second time yesterday.The first time i tried it had come out really good.I had to bake it only for 30 mins on top rack. Yesterday i baked in the middle rack.It was looking good when i checked at 30 mins but wasn’t baked well in the centre.I kept it in the oven for 5 mins more (i put it in the top rack this time) and after that the cake went down in the centre.It was completely uncooked in the centre.What could be the reson for the perfectly raised cake to plunge in the centre after baking? I know your recipe is right but i thought I will ask for your input on what could have gone wrong? Shilpa: SK, I have noticed this happening when we open the oven door again and again. Cool air gets into oven and that causes it to sink.Some people say over mixing the contents sometimes it happens(I am not sure about this though). hai, this is really very nice and good recipe..how to grease cake pan?is it necasery to grease?can i use oil?or flour to grease? What country are these recipies from? They look good! yumeeeeeeeeeeeee ! it,s really tasty……………. i love the way u explain it. You make us konkanis proud. I have tried several of your recipes and have never been disappointed. It’s also a great site to browse when I’m feeling nostalgic and home-sick. Am now going to try your cake recipe for my son’s b’day. I also have a request – would you happen to have a good recipe for veg. manchurian gravy? Have tried your Gobi manchu – it was yummy! Have never been able to make India Chinese restaurant style veg. manchu because the gravy comes out different and not so great every time.. Thanks for helping so many of us make yummy meals. Your date cake is just awsome. No words to express. This is the first cake I ever baked in my life. I used to complain that i can not bake …, but whoever ate this cake gave so many complements to me. & that should go to you. & thank god for providing the raw ingredients. I am going to try your eggless friut cake very soon. I was just wondering if you know of any alternate flour to replace maida or all-purpose flour. My kid is allergic to wheat(gluten) and egg and this is a perfect dessert I am tempted to try. What do u think of soya flour. Shilpa: Sorry Nivedita. I don’t know. You have to try it out. I tried this cake y’day but with prunes and almonds as I didn’t have dates and was out of cashews. But it came very good and very soft and by today morning it was all over. Thank you very much for you and your pachi. Shilpa: Nipa, reduce the sugar level and try. You have to mix till all the ingredients come together. I am a regular visitor to your site. I have been on a healthy eating mode and have lost up to 12-13 kilos in past few months the process has been little slow because I have also binged quite a lot in btwn. I am a food lover so need less to say this has been a battle but I came up with tasty non fat dishes after a lot of brain storming. I think you should start a section for dieting and ask people to share their recipes. I am an Indian and it was hard for me to come up with the dishes which had Indian ingredients tasted nice and spicy but was healthy and non fat. I can share recipes I have first let me know what you think. Shilpa: Beena, thanks for your advise. I will get in touch with you if and when I decide to do the section. I tried the cake yesterday night as i was dying to try this out.It came out simply marvellous.thanks for sharing this recipe.I baked the cake in microweave and it came out very soft and yummy. I am strictly vegitarian. Dont eat even egg. I always search for eggless cakes. I was searching for info abt Wet Dates (Khajoor). I found ur site. Extraordinary site. Mala tee pahoon aani vaachoon khoooop khooooooooooop anand zala. This is the third time I made your cake, it came out well but in the centre, little portion was unbaked. Do you have any idea why it was so? Shilpa: You should have kept it for some more time. Use a sharp knife or tooth pick to insert in the center and check if it is baked. If not, try to keep in lower shelf so that it does not get burnt from top. OMG. This looks good. Really good. I would not be able to make this cake at gunpoint. I guess I just need to print out a pic and salivate. Shilpa: bailelobammunu, its one of the easiest cakes to make. You can definitely do it. Try it. The decoration is not required, as I was taking it for a party, i decorated it. It was the first cake for many people. So I am sure you will be able to get it right. Shilpakka….baking soda is the same as the soda we use in buns etc….that is Soda bi carb?? Shilpa: Both are same Varsha. I got a very nice article about difference between baking soda and baking powder. Check out. I LIKED THE RECEPIE VERY MUCH BUT AM CONFUSED ABOUT THE OIL USED IN IT . PL CONFERM WHICH OIL IS IT THE MUSTURD OIL USED IN IT . Shilpa: Use any oil that does not have strong smell(like mustard, coconut and sesame oils). I normally use either vegetable oil or peanut oil. This cake recipe is awesome. My 4.5 yr old son just loves this. He is allergic to wheat(gluten) so I made it with gluten free baking mix which is made out of brown rice(more healthier), baking soda, baking powder and still the cake tastes yummmm. Thanks for the excellent recipe. Also, I could not find seedless dates today but found crushed dates. Any ideas approximatley how many cups would 18 dates make. I want to try making the cake with crushed dates. Wonderful eggless cake. I will try it and let u know soon. Thanx for sharing . Hi Shilpa, today i made this cake, it tastes good but littlebit sticky. Also 3/4 cup milk wasn’t sufficient so i added 1 more cup of milk. Plz let me know what went wrong. Thanx for sharing this recipe. thanks for the recepi. will defenetly try this out and let u know. I have lurked on and off on your site for a few months now and am amazed at the amount of effort you put in here. I like this recipe and am going to try it. Thanks for sharing such wonderful dishes with us. You are making the world a better place to live with your enthusiasm and great recipes. i must say this was one of the easiest recipies i have come across. i made it for my b’day last week it was wonderful. all my guests loved it. i was well pleased. thanks to you for sharing the recipe with us. i just have one question for you please. i dont have a gas oven, instead i have a fan oven, could you please tell me the settings for that and the cooking time. Shilpa: Nila, Sorry, I don’t have any idea. If you have baked it once already, I think you should follow the same. i’ ve alredy posted earlier but didn’t get answer. Also i wanted to tell u that it was ready within 25 minutes. Plz tell me how much milk we’ve to add for soaking dates. Thanks. Shilpa: Swati, you have to add the EXACT amount that is mentioned in the recipe. I have tried this recipe many times and it works fine. 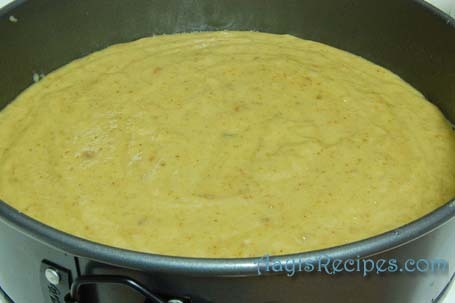 The batter becomes a bit dry compared to any other cake, but that is the required consistency. There is no need to increase/decrease the amount of milk. I tried this recipe Shilpa, with whole wheat flour and it turned out Superb. This recipe is a keeper for me now. I tried out this cake twice and it came out very well …. also, since i don ‘ve an oven i baked the cake in the cooker only … it was awesome. I baked the dates cake, it was really good. Thanks for your cake recipe, I would be happy to try your recipes more. Shilpa: I haven’t yet tried baking in cooker, but will try to find it out. can i share this recipe and post it in my own blog? Shilpa: Wen, you can do that, but please provide a link to this post. I made this cake for my birthday and it was tooooooo good…..just couldn’t stop eating it, my both kids also loved it. This cake recipe is surely going to be in my family favorite recipe list. Thank you for posting such a delicious recipe. i made this cake using my sister’s oven, thats why it came out right first time. but i have a fan oven . if anyone else has tried it using the fan oven. please let me know that will be helpful. Tried out your date cake today and it turned out really good. The only problem was that it was a bit burnt at the bottom. Any idea as to why that happened??? Your receipe looks simple and the picutures look tempting will try it out asap. Please let me know how you did the icing as I h’ve never tried decorating cakes. I have a quiestion..I asked so many people and searched so often on the internet..but nobody knows the answer..
hai, I tried first time your reciepe because my daughter cannot eat egg ,it came out very nice. thank you very much. no reply from you.i have sent one dal recipe with green tomatoes and green chillies.waiting for the review. i tried this wonderfull cake twice both time it came out so tasty and soft. thanks a lot to share such wonderfull recipe. shilpa can u plz tell me about your electric oven setting like cake should place in which rake and fan should be off or on ? came across your blog while searching for recipes. your way of presenting the recipes is really good. your dates cake looked tempting and tried it last evening. it came out very well. my 4 year old son too loved it. will try more of your recipes soon. thanks a lot for the lovely recipe. Shilpa: Yes Divya. You can post it, please give a link to this post. The recipe was really easy and resulted a good cake. Forcibly I resisted trying the low calorie version without oil, Since I tried this the first time. Will surely try that next time. My only concern was, we felt it a little more salty… would like to try it with little less baking soda (3/4tsp) in next iteration. Hope it will not effect the fluffiness. 1. The white buttercream roses-china roses, look fab!! 2. Last time when I made this , I used brown sugar n the color went lovely brown n the cake came out crisp on out, moist inside! 3. Yest. for a 2 year old’s bday, I baked a heart shaped cake with the measure n directions precise as urs, prepared buttercream first time, hence though refrigerated, it got runny so I had to ice it n put back in the fridge, n topped it with mini M&M’s!! They loved it a lot! THANKYOU (big one + HUGS) for ur ideas the dates cake is contagiously spreading!! 😀 shall send u a photo via mail once uploaded…take care..bye.. Thanks a ton for this recipe. I have prepared this cake many times and its been a hit among my family and friends :). I made the cake.But it did not come fluffy.no air in between .I used hand mixer to mix oil and date paste.Or do you think i shud hae kept fr a longer time? Shilpa: This cake is a bit dense because of dates. I am not sure why it did not come fluffy. sorry. yet the taste was absolutely amazing .Thanks for spreading the cake fever!!! Its a great n easy recipe. i liked it very mush as its eggless. Also i love to cook n try new dishes so is there a possibility that i can add my recipes to your website. I tried your cake recipe for a party at my home. It was a superhit. My friends and my husband’s friends enjoyed it very much. I made some changes in your recipe. I used self raising flour instead of all purpose flour. Also I used pitted red dates as brown dates are not available in my area. And I don’t have a conventional oven. So I baked in a microwave oven for 5 minutes. After baking for 5 minutes in the oven, I allowed it to remain for another 5 minutes without switching on the machine. The cake was very soft and delicious. Thank u very much Shilpa. Doing a great job. Keep it up. My family loveddd this cake. My dad doesnt like cakes usually because they have eggs in them and always complains of the “egg smell”. he lovedddd this cake! Shilpa: Yes, allow it to cool before taking out from pan. I am a first time user of the blogs and have found these receipes great. Since I have never made a cake in my life please tell me if all purpose flour is the same as plain flour or self raising flour. I am so confused and don’t want to mess it up for the first time. Shilpa: All purpose flour is same as plain flour. Self-rising flour is all-purpose flour with added salt and leavening (baking powder). Help where can I get baking soda, or what is the indian word for it. Here all the supermarkets have baking powder. What does the soda look like is it liquid??? Shilpa: Its also called meetha soda. It is a white powder, looks exactly like baking powder. you can also use ghee (sajuk tup) for this, to make it more healthy instead of oil. Hi I tried your Dates Eggless Cake and it came out really tasty and wonderful,nice fluffy spongy cake!!! With this exact measurement there is no chance of anything going wrong.My whole family loved it! Thanks for the recipe. i m planning to make this cake..but i dont hav oven or microwave.. plz suggest me how can i make this cake without using oven or microwave. can i make this cake in cooker by giving heat.. plz help..
taste of this cake is very tasty. I was searching for some simple, and quick cake receipe and stumbled across yours.Started of relectantly as Iam not a big fan of dates.BUt after baking, I as very much impressed.It was super delicious.Thanks for the wonderful receipe.I will post it my blog with the picture and the link. Hi this cake looks fantabulous and tates so good that now I am hooked on to it. My boys 5 and 2 simply love it. Thanks for posting this awesome recipe. i absolutely love this recipe. i’ve made it maybe 5 times already. i’ve tried it the way it was written (except I substitute soymilk for regular milk- I’m vegan! ), i’ve tried it lowfat without oil, with decreased sugar and it still comes out great everytime! i can probably eat the whole cake in one day. 🙂 thanks for sharing your recipe. the place that i buy dates from has run out recently so i picked up some dried prunes instead. i was thinking about this cake and wondered if prunes could stand in for the dates. i know the sugar content is not the same and the flavor will be different but how interesting would that be? do you think it will work? Shilpa: No idea kim :(. But I feel it will work well. Shilpa: The above measure makes the cake for about 8 people. I tried this date cake & believe me,in first trial it was superb.It was really very fluffy & moist!Thank u sooooo much for this great recipe. U’r all recipes r too good.I like u’r style.Daily i look for u’r new recipes.Keep it up! The cake looks yummy….i’m gonna make it very soon. Thanks! Shilpa: Thats an interesting feedback Maurine!!! I subscribe to your blog, so I am a frequent visitor to your site. I enjoy the recipes you post. I baked this cake 6 months ago, and as you aptly mentioned, â€˜cake feverâ€™ has spread around my friends (and their friends). Thanks for posting such a wonderful recipe! I just checked out your Egg curry recipe, looks interesting. I will give it a shot. We have been eating brown rice for a while now, and I use slow cooker to make it. I keep it just before I go to bed, and next morning, I wake up with enchanting aroma of brown rice. (It also gets cooked very well in slow cooker)..
Anyways, keep the good work going..
Shivani, I got a sloecooker as a gift and I was wondering what I can use it for since I am a vegetarian. Saw your comment and interested to know the ratio of rice:water for the brown rice. What kind of brown rice do you use? And what settings do you use in the slow cooker. ur reciepe is so interesting & i feel it very easy 2 try this out. infact i love date cakes but i dont know their reciepe.. but now u really helped me.. thanks dear..
yesterday i tried this cake using cooker, wow its turned out great. thanks for sharing. Shilpa: Hi Karuna, can you please explain how you made it in cooker. I have never used cooker for any cakes and many people wanted to know about it. Thanks in advance. I made this cake last week, it turned out great. ghee or melted butter instead of oil. The smell of oil was very strong. Please advise, thanks a lot. Shilpa: As I have mentioned above, you can make it without any oil. Your site is really interesting and you put everything in a very simple way and makes me want to try it . I tried this cake today and it was YUMMY .What is butter cream icing you have made for this cake ? can you tell me the recipe for that ? Also is it possible for me to do a whipped cream icing without a electric mixer or kitchen aid at home ? Shilpa: Please check the post now. I have given link to the buttercream recipe. You could try using a whisp and beat the cream. I have been visiting your site for past few months. I tried to make this cake at home. It came out really well. It was very yummy. I am from Mlore actually. I observed so much of difference in the konkani cooking in north kanara and south kanara. I tried this recipe, cake tasted Awesome. I read most of your recipes, my hubby is a great fan of wada pav. I really appreciate your time for posting these recipes. The cake turned out to be awesome. the simple recipe made this my first baking project and i loved it. so far i have made it 4 times and whoeve has tasted it has loved it and asked for the recipe. Thanks for sharing. i have an doubt…i put baking powder instead of baking soda, thats why its bcoming hard or why ?? what’s reason why my cake become so hard like a stone ?? pls do reply my ques…. Shilpa: Pooja, I have no idea. I have never baked it in microwave, but many of my readers said they tried it in microwave and they got very good results. Try using baking soda. truly the ‘fever’ is spreading!! I tried your date cake and it came out wonderfully. I used wheat flour instead of maida and was a little apprehensive about it but it turned out fine. Thanks for such great recipes! I am regular reader of ur blog and thanks for posting whole lot of M’loreran dishes. Today for the third time I prepared date cake within a month and turned out to be a favourite cake for my daughter. Its really spreading like a cake fever among my friends. I tried this cake and everyone loved it. Thanks for such a simple and delicious recipe. i made this cake this afternoon for my mom’s birthday and it turned out awesome. i just loved so did everyone. just that i didn’t do any icing on it. i was hesistant first to do something like this without an egg as i always baked one with eggs. but thanks a million. i will make t his more often now. I tried this cake and it was good. I used butter instead of oil and also I used on 15 dates instead of 18(the dates were really big), it was sweet enough. Thanks for such a simple recipe. I have to try without oil next time. Thanks for such a lovely recipe. I tried this one and it was good. I used butter instead of oil and also only 15 dates instead of 18(they were big dates). Next time I want to try without oil. started browsing ur site since few days,great recipes. Shilpa: Bhagyashree, 1 cup measurement in the measuring cups that you get in market, usually its a set of cups and spoons with exact measurements(like this, I have a similar plastic one). I think its about 126gms(according to google). You should use “oven proof dish”. You will get these in any supermarkets these days. I am not sure where I said use “powder”!!!!. But anyway – greasing of dish means, applying butter to the cake vessel and then spreading some loose flour(abt 1 tea spn) so that the vessel gets a nice coating of flour(the same flour used for making the cake). I came across your site sometime back when I was looking for tasty Indian chicken recipes to cook for my husband, as I did not eat or cook chicken while growing up – I am a self taught cook and am always looking for good recipes to try! I now come to your site regularly and love browsing for interesting ideas to cook vegetables and chicken other than the ways I know. Besides the wonderfully easy recipes that you post, I would really like to thank you for taking the time and effort to collect your family’s recipes (which to me are like heirlooms) and sharing them with all your readers. I personally think food spreads joy and you have added to the joy of many-a-families – so thank you! As for the date cake, believe it or not, it was my first attempt (ever) at baking a cake and although your recipe looked easy and very tempting, I was worried about it. I have always been told that baking is an exact science and not every one can get it right.. I am a person who finds it hard to stick to recipes, as I always improvise to add my own touch but I stuck to your recipe and thank god I did (well, almost!!). I used big mejdool dates and less sugar and half the quantity of oil and it turned out absolutely fabulous!!! I got home from work at 8 o’clock and the cake was ready for us as a lovely dessert by the time we finished dessert.. My husband has already polished off half of it and said that he really loved it. It is a lovely recipe and one which I will definitely try again. Keep posting as I really look forward to seeing your traditional recipes and pictures – actually the pictures are what makes me decide to try the recipes out..
All the best and many thanks again! I baked this cake, it came out very yummy. My 2 year old son is fan of this cake. First off, a big thanks for this wonderful & truly awesome recipe!!! This cake is super! I doubled the recipe & it disappeared within 2 days! The best part about this cake: doesn’t need too many ingredients, doesn’t need too many pots n pans for the prep work, doesn’t need any special kind of equipment, all the ingredients are readily available and the taste of this cake is really really good!! Now coming to the actual cake: I doubled the recipe & baked it in a 9″x 12″ dark non-stick pan at 350F. The edges of the cake rose well but the cake seemed to sink in the center, don’t know why. After the cake was baked (about 40mins or so) I let it cool completely. Then when I turned it over, the middle part stuck to the pan & the edges came of instantly! This has happened the first time….and I have baked lots of cakes. I had greased the pan very well…so have no idea what went wrong. And lastly the amount called for adding the nuts which is optional…..I changed that & added 1/4 cup of chopped walnuts. Next time I’m going to increase them to 1/2 a cup, they taste awesome in this cake…..the nutty texture of the almonds with the chewy texture of the dates goes well. (remember this is for the recipe which I had doubled…..so if you are going to bake the cake with 1 cup of flour I guess 1/4 cup of chopped walnuts should be good). Next time I’m going to be adventourous & try the same cake with whole wheat flour & see what happens. Will post back here to let you all know. But to all those who are ‘thinking’ of trying this cake: Go Ahead!! You will love this cake! Once again Shilpa, a BIG thanks!!! And please do convey the same to your Aunt who shared this recipe with you!! I tried ur date cake n it was absolutely delicious.Only change I made was I used Whole wheat flour instead if Maida for health reasons.Thanks a ZILLION!!! i want to try it with whole wheat flour too….since you’ve tried it, i wanted to know how did you like the taste & texture of the cake? I tried cake..n must confess…the softest, fluffiest n brownest non-chocolate cake that i have ever baked. the oil had no smell in it. will try with ghee and wheat-flour next time. it was appreciated by my family as well as by colleages. thanks for posting such great recipe. Made the cake…..again!! It’s too yummy & dissappearsso quickly that I had to bake it again. And I always double the recipe! This time tried it with whole wheat pastry flour. It was good. But not as good as the all purpose flour one.With whole wheat flour it comes out more dense & heavy. Also this time I baked it in 2 pans & the cake didn’t stick to the pan. My daughter took it to school today! Thanks for the recipe again Shilpa! Hey its really good idea,and it has very simple steps to be followed. Shilpa: I use 9 inch round pan.You can use any pan you have. But make sure the batter is only till 3/4 the volume. If it is more than that and you have only one pan, divide it into two batches. This is really a ecellent recipie. I liked it very much. I had a query that all time i prepared he icing for cake,it first sets on cake but after its kept at room temp. it starts melting. So can u tell me the exact recipie of preparing icing and how to check that consistency is OK.
Shilpa: Vinita, I have used this recipe for buttercream. It never melted. But if you have a recipe that is butter based, it will surely melt at high temperatures because of butter. If I find some recipe in future, I will surely update. I am yet to try this recipe with dates but I make the same cake with figs soaked in warm milk for about 2 hours. The procedure and recipe remains the same. The fig cake also comes out excellently well and my kids and friends gulped the cake down within minutes. pls do share some tips on making icing/the cream. Thanks. i tried this cake yesterday, it came out nice and tasted well too, took some pieces to my office, everybody liked it so much… thanks for the wonderful as well as easy recipe. This looks simply great. I cant wait to try this at home. Thanks for sharing it. Would like to know the weight of the dates for the date cake, as there are some many different varieties of dates and they differ in weight. I also want to try it with chestnut puree, another reason why I need to have the weight. ur recipe is fine . i tried it in microwave. came out well.if u could send me some other recipes that can be tried in microwave that would be helpful. like butter biscuits…. bakery products. thankyou. have a nice day. First time visiting your blog! Amazing collection of recipes. The eggless date cake particularly caught my eye, am going try it this weekend! i am planning to make this cake for a b’day.i was jus wondering wat icing wld be best for this cake flavour. I found this cake to be very yummy. Thanks for posting it. I wish to bake this cake for my in-laws and send it to India with my parents when will be leaving. So do u have any idea will this cake last during traveling? First of all, let me congratulate you for your great work. I got married few months ago & my husband’s birthday is coming up in 2 days. I want to bake this cake and surprise him. We are staying in a hotel & don’t have an Oven in my room. I was wondering if the cake can be baked in a microwave oven. If yes, please let me know the procedure & time taken to do it. A quick response would be very much appreciated. Shilpa: Aparna, as I have replied many times to different readers here, I have never baked the cake in microwave. Some of my readers did it and they said it comes well. You need to try. I have tried your date cake recipe and it is wonderful. I adapted a little by using chopped dates which I warmed in milk in the microwave before grinding. I also used more dates but almost no sugar since I do not like things too sweet. The result was great. Thank you so much. I live near Bath in England so the reach of your delicious recipes has extended across the Atlantic. I look forward to trying more soon. Thanks a lot for this recipe. I made it yesterday, it was very tasty. I am scared of baking coz every time i try either fire alarm goes on or the cake remain uncooked. But this recipe turned out perfect, now i feel i can bake too. thanks again. i came accros this website while searching for date cake recipe… its really great responses you get and definitely im going to try it today. can u tell if i can use self raising flour or plain flour for this recipe? hey shilpa….i dont have an oven…..can i bake dis cake in pressure cooker? hey shilpa….i dont have an oven…..can i bake dis cake in pressure cooker?and do i need to grind the dates with sugar in a mixer? This recipe reminds me of a date-nut bread that is made in my family, although I think our recipe has eggs in it, if I recall correctly. The dates are just chopped into pieces, not blended, and we make it in empty cans lined with wax paper to get small rounded loaves. It’s delicious! I may have to give this recipe a try. i prepared your cake and it is so delicious,tempting.i ate 3/4 of the cake. i am thinking of preparing this cake on evry special occasion. thankyou for this wonderful recipie. one thing i added ghee instead of oil that too 1/2 the quantity mentioned by you and it came out nice. I am new to your blog. But i tried your date cake on my husband’s birthday. The taste was really great, but it didn’t turn out as fluffy as shown in the photograph. I had prepared it in a microwave oven. Would you suggest to add some milk to make the consistency ribbon-like, because the consistency of the batter was quite thick. anyway, thanks for sharing such a awesome recipe. Shilpa: Manasi, it is a bit dense cake due to dates and the dough is quite thick. I am not sure if microwave made it denser. I don’t think milk would make it any more fluffier. It sounds Delicious…. I think i am going to spread this Wild fever soon…. its tempting & i am going make it today….& give to all my friends…. I am back with reviews of ur delicious wild fever Cake…. Tham(yummy again) from my 2 year son….We have already finished half of the cake The other half is packed & sealed for all friends thats y they r there….U r Gr8.. I did slight change as u have mentioned in the Blog.. which was instead of 1/2 Cup Oil i used 1/4th Cup & added 2 small baby bannanas to give some moisture…It tured out gr8… thanks re…. Tried your date cake receipe and it came out marvellous!! I baked a cake for the first time and I am amazed at how easy this receipe is and how superb the cake turned out tobe. I had to bake it just for 35 mins and it came out super spongy and fluffy!! Thanks to you and your pacchi. I tried the date cake ,its really EXCELLENT!!!!!!!!!! Tks so much…..by the looks of it you are are very generous person…………. and I am sure all good cooks are. Tks for all your helpful tips and the wonderful receipes. I am a Mangalorean and will try some of the receipes. can u tell me the difference betwwen: soda khar, eating soda, baking soda and papadkhar. Is it the same and how much of baking powder is added in general to a cake of 1/2 kg each flour, eggs and butter. Tks so much. This post always was lodged in my head, mainly because of the interesting “paachi” side story you wrote – I finally made this cake yesterday, you are not going to believe it, it was COMPLETELY gone in 1 hour, the main culprit being my husband. Interestingly, he said (whilst munching on his 18th slice!) that it tasted like a form of vattayappam (the mallu snack). This is such a quick and easy recipe, I had the cake made in 1 hour flat – 30 minutes prep, 30 minutes baking – this will be a great cake to make when guest come over unexpectedly. Thanks for sharing!!! Great site. I will be following the site. I’ve tried this cake recipe a couple of times and each time it comes out better. Thanks a lot. Everyone at home enjoys this cake. Can this eggless date cake be made on a standard microwave? I do not have the convection model. Shilpa: No Suchi, this recipe should be exactly followed as it is for the best results. Yes, the batter is stiff, but when baked, it comes out properly. Thank you for the wonderful receipe.i must say the cake came out well and more important it was eggless.Thanks once again for the lovely receipe. I browsing over some date cake recipes, I came across your website. Your recipe looks really easy to prepare. Can Medjool dates be used instead? Shilpa: I think they can be used (to tell the truth, I don’t know how they are different than any other dates). Shall give the recipe a try shortly. Thank uuuu for the wonderfull recipe. I m into cake decorating, but surprisingly poor in baking. Thanks for so many recipes..will try this one this weekend. This is the first cake I tried. It came very well. Taste so good. All of my friends liked and asking me to prepare this cake again. I prepared for 3 times and still my mouth watering to taste it again :). Thank u so much for this wonderful wake. Shilpa: Padma, I don’t know what is rice cooker cup. The one I used here are US style measuring cups. You can use this chart to convert it to grams. I have been browsing your site and trying out recipes. I dont eat eggs and hence my choice of cakes are very limited. I have baked a few cakes but this wonderful soft cake really was the best. thanks shilpa and keep up the good job. i tried ur cake recepie…it was great.!!! thanx for this worderful cake recepie. Hi Shilpa – I’m a fellow Konkani and found your site a few months ago when I was searching for tavsalli (which I have yet to make). The date cake is the first recipe I tried and LOVED it. I’ve made it 3 times thus far and it’s been a hit each time. I’m married to a Gujju and can make better gujju food than Konkani food because its so easy. But your site is an amazing resource for all those recipes that my mom made growing up. Brought back many memories. I made this date cake as a surprise for my husband’s birthday..it was so easy and so yummy. You bet the cake madness was on in the party, everyone asking about the recipe. Thanks so much for such a good recipe. But it was yummo..thanks again. It was my second eggless cake which turned out excellent first one was the same recipe I tried yesterday and it was over before one could spell C-A-K-E. Thanks for the great posting , today I made few cahnges added whole wheat flour , half cup curd along wiith almond , pistachios and sesame seeds for omega 3. It turned to be a big chewy than yesterday but definitely a healthier option.My young neighbour loved it. Good option for diwali as well. Would love to try your non oil option. Thanks again… for posting such a lovely recipe. Shilpa: I don’t know if apple sauce can be used. As I mentioned, you can completely leave out oil. In your eggless cake is it possible to add a little butter instead of oil. If yes, then let me know the amount/quantity that can be added. Made this cake ..posted in my blog..superb cake..
Hi. Brought back dates from Saudi Arabia, off the palm tree. Had never made cakes before and found this, so gave it a go using the dates I had brought back. Well it turned out great. wish I had brought back more, have to wait till my next trip. Am one of ten UK Middle East truckers left going in Via syria ferry from Greece. I tried this cake today.I used butter instead of oil. It came out very good.My kids loved it. just wanted to let u know..i baked this in the microwave and it came out beautifully..in 4 mins!! so quick!! i made it in a loaf pan , so was like a date bread!! Wow what a great recipe! I have been wanting to make this for a while but finally I did it yesterday. My son is allergic to milk so I used soy mik in stead and ground almonds with dates. The cake was amazing. My kids thought it was chocolate cake because of the color. They gobbled it up. Thanks for this lovely recipe. It’s going to be a regular in our house. Everyone is eyeing that last piece!! I tried the date cake for my Grandsons birthday as he is alergic to eggs. It went down great although I cooked it for 1 hour on 180 degrees. Everyone said it tasted like a ginger cake , I may add a half teaspoon of ginger next time. I also left out the nuts and subsituted the milk for rice milk as he is also alergic to them. I also put all of the wet ingregients along with the sugar into a bowl and blended them together, it made it easier. I also tried the pineapple cake (eggless) and baked it for 1 hour too and it also was received well. I’ve bought a new otg an looking ou tfor recipes with reviews. Happy to get into your site.Looking forward to a great cooking relationship. I’d be happy to get recipes for diabetics. ur recipe is wonderful my father in law loves cake but he don’t eat egg………………thanks i ‘ll try 2day only. All roads seem to lead to your site, Shilpa, as I find myself here quite often when researching a recipe. The only dates I have are already chopped and in a package from the grocery. I have no idea what amount would equal 18 whole dates. Can you make a guess? Shilpa: MrsSW, Thanks for your kind words. I am sorry, I don’t know about the amount you could use. your cake was wowed by all thanks a ton it was the yummiest homade cake I ever tried out. I am from Sri Lanka. I will be trying this recepie & wil give you a feed back. Will it be possible to give me the receipe for milk roti. I am unable to locate it in any site. Hi Shilpa, I have been really enjoying reading all your recipes.. hats off to you, I can’t believe even i can cook these delicious items so easily.. and they turn out perfect.. I tried this Date Cake, came out superb.Just one qus. After baking I found the upper side of the cake little hard n crusty.. is that normal or did i make some mistake? P.S: This is the first time i have ever baked a cake in my life and my husband cant stop praising me..its just yummy! Shilpa: I think it is normal if the top was not very hard. It looks yummy.I wanna prepare this soon.Could you please let me know is it possible to make cakes by using pressure cooker ? If so let me know the method. Shilpa: Yes, you can make it in pressure cooker. But I haven’t tried it. Sorry. I tried the recipe and it tasted great. However, I read some of the comments from other people and so I added 1 tsp vinegar thinking it would make the cake soft, but not sure what happened and the cake sank in the middle. I also made it in the mini muffin pan and the flour rose too high so I ahd a hard time scraping the cake out. Please tell me what could have gone wrong. Shilpa: Please follow the cake exactly. Some people might have got it wrong, but there is no issue with the recipe which is tried and tested many times. I made this cake over the weekend and it was great! I have never made a cake that was this easy. This is one of the best eggless cake recipe I have made so far. It was light and fluffy! it’s also a great cake to frost or add icing to as well. Can’t wait to pass along the “cake fever” at my work too. The best dates cake I ever made! I am not very good at making eggless cakes. There is always something goes wrong and the cake turns out as a rock. It is very dissappointing! HRRRR! I just followed the above recipe and the cake was SO good. Usually the procedure is very complicated, but this one is very easy and less time consuming. If I may add something, I would say serve the cake the next day instead of the same day that you make it. The cake will become more softer the next day. I made some changes though, i added some eggs, and blend them together instead of grinding them to a smooth paste . Besides while baking i added sultanas and some dates to the mixture. The cake turned out to be yummy, like the dry fruit cake. My husband enjoyed it a lot. I really like your recipe for the eggless cake. Thanks for the details. Shilpa I made the cake and this came out very good. I have forwarded this recipe to mother in law.Thanks for sharing it. Really, it’s yummy… dates are good for health. i made it on convection mode..stil tasted gr8. Shilpa, i made this cake for my wedding anniversary yesterday..It came out a winner..My hubby on tasting the cake, asked ” Its delicious! From which store did u purchase it?” AHA!!! That comment made my day..He was surprised to know that i had baked it..Since i baked a cake for the first time..and it was success..Thanks a lot for making my anniversary very special..
Why dont we use eggs in the date cake? Does it still come out well? I dnt have an oven separately but do have an OTG but it does not have the temperature option. I made your date cake and it came out excellent. I made a small variation to your recipe that I added some eggs also. Keep going, shilpa. Hats off to you. I ate this cake at a friends place and it was wonderful and Rich !!! Thank you for this wonderful recipe. I made the same and it turned out really superb. I didnt do the icing mainly because I wasnt sure what veg shortening meant. can I substitute the same with butter. You were so right.. it just starts cake fever… owsome recipe.. Already baked the cake thrice in a weeks time. Thanks a lot..
One thing I used Baking powder instead of soda and added half tea spoon fruit salt(unflavoued/Regular Eno). Cake became smooth and fluffy..
Hi, this is really a very easy recipe. I tried and my husband really appriciate it. Thank you. I tried baking the cake yesterday in a pressure cooker and it came out really well. Everybody loved the taste but the sweet eas more probably due to imported dates. I have seen many people asking how to do it in a pressure cooker… Here are the steps..
After mixing the ingredients put it in an aluminium or steel box or a baking dish and place it in the cooker don’t put the pressure (whitle) just close the lid for about 25 to 30 minutes on a very low flame and your cake will be ready to eat.. You can also try putting a butter paper in the bowl and then put the mixture.. I tasted this at my sister in laws place and it was great. I tried the dates cake in a pressure cooker, came out well, soft and yaummy. Hi Shilpa This is Helan. It was really a Wonderful Moment Sharing This Tastier Cake With My Husband. It Was Yummy. My Husband was Really Impressed By This Cake He Specially Thanked You For Giving Me Such a Great Idea. And Not Only This He Also Asked You To Share Few More Recepies. Thank You So Much It Was a Christmas Gift For My Husband. M sooo thankful to you dear.. I made this cake and the simple egg cake for potluck here and oh my god ! people just dint stop prasing me. There were guys asking for recipes 😉 Not a single piece was left out.. it just got over like pooof !! And with every praise I recd.believe me I thot abt u .. I can never thank you enough. I had lost confidence when I cudnt cook that nice in bulk when guests came in. Today i can proudly flaunt all my recipes 🙂 from your site . Thx again. Hi, I made the cake but the inner portion was kind of sticky. However, the taste was good. Thanks!!! I like to try this cake.Can you pls. tell me how long shld. i beat the mix while adding maida with the cake beater or using a spoon?.GOOD DAY.Thanks. Shilpa: Mix till the batter is uniform. Wonderful recipe..Tried it thrice already..Came out better each time..Thank You for sharing.. The cake was realllllllllly wonnnnnderful.This was the first time I baked the best cake coz previously the results were not sooooooo nice. Hiya! I made your date cake today and wrote about it on my blog. I’ve made this dozens of times before and I absolutely love it. I’ve made it vegan by switching out the cow’s milk for soymilk and it works perfectly! Thank you for sharing this recipe. Thanq 4 this woderful recipe. Came out really nice. my husband who has an egg allergy ate it like anything & my son who doesn’t like sweets much just said “yummy”. Of all the cake recipes I have browsed through on the net ,which is quite a lot, this is the simplest and the tastiest. I did not get all purpose flour in the supermarket here ( Bristol,England) ,so I used self-raising flour instead and left out baking soda and the cake came out well. However, I have just one request, Can you please give the exact measurements of the ingredients used , in gms and mls ? Not that the original was not very good in itself but I get bored repeating recipes. So I have tried a lot of different variations on this. One of my favorite variation is to add about 10 soaked fig (anjoora) in the recipe. I ground it both with the dates smooth once and in another instance a bit coarse so you get a few chewy pieces in the finished product. Either way works fine. Reduce the amount of oil to 1/3 cup with this recipe to get a less dense cake with lots of dry fruits in them. I tried this cake recipe and i must say the cake fever has started in my home. My husband just loved it and wants me to bake it again and again. Thanks Shilpa ! Thanks for this easy recipe. The cake came out very yummy. Everyone liked it. i keep making this cake over and over again…and its always been a hit! My husband’s friends requested me to make the Dates cake for their super bowl party tonight. and its coming off the oven now…all soft and fluffy and delicious!! Thanks for posting all the wonderful recipes. You really have patience to take pictures of each and every dish you prepare. Tried out the date cake it was delicious only that the cake was a bit oily. I think we need to reduce the proportion of oil in the recipe otherwise the cake was yummmmm. Thumba thumba Thanx for this wonderful recipe. Tried it today, it came out well. My hubby felt it is still bit undercooked in the center. it took around 45mins. I think i should have left it cook for another 5 mins.I have this old styled round glass top oven. However the taste is great. This was my second attempt of baking a cake and both were successful. Need to know more of eggless cakes as we are strict vegetarians. i tried the date cake and the result was excellent.but i didn’t soak the dates over night in milk.won’t the milk get spoiled by leaving it out for so long.Any way it is a great cake. Shilpa: You can keep it in fridge. It is soaked only to make it easier to grind. So if you can grind it without soaking, you can do that. I just microwave milk and dates for 2 mins and they get soft. So I don’t soak them. I have a question now, CAN WE USE PLUMS INSTEAD OF DATES AND FOLLOW THE SAME PROCEDURE AS ABOVE? Shilpa: I haven’t tried it Vidya, so can’t tell you. Sorry. I tried your egg less dates cake yesterday and it was yummy.I did a small variation by reducing the sugar and oil as 1/2 cups.Thank you so much. Hi Shilpa, I have a cake recipe which uses same contents as yours, but for milk. It uses curd instead. I made cake with thisrecipe and it turned out fine. However when i tried substituing curd with milk in my recipe, i found the cake bit oily and sticky. Please suggest what might be the reason. Is it that milk usually makes the cake bit oily and i should reduce the quanity of oil with it, or dont add oil at all? Shilpa: This is not the exact recipe at all. The above one is date cake and yours looks like chocolate cake. I do not have any idea why it is not working. Shilpa: Kajal, it is hard to grind dates on their own. So add milk while grinding to help in grinding. Is it fine to bake this cake with self rising flour and little less oil( I use Olive oil). Please let me know if it won’t change the taste of the cake. Shilpa: I don’t know about self rising flour. About oil, I have already mentioned that in the post, please read the post again. This cake became so famous in my family after I made it. easy to make and great taste! Thanks for the awesome recipe! I made for my fiance’s birthday last night. Everyone loved it! It just took 20 minutes to make, apart from the baking time. Thanks for the buttercream icing link too. I made icing for the first time yesterday and it turned out better than the ones I used to buy from the store. I am just baking your date cake now – it smells so good! I wanted to ask, how exactly do you grind the dates? I chopped them up small, and cut & ground them with a pastry cutter, but never quite got them all into a paste. It was a paste, but with bits of dates in it. I hope it turns out. I tried the same way but the cake colors were diferent what my friend made. Her cake is completely dark brown and mine is brown on top and light brown inside. I used costco pitted dates. Shilpa: Please read the post, your question is already answered in the post. this is navneet frm spain .i really liked the way u made the cake.but jus one thing to ask if u don have baking soda ,can we use soda water or coke tin for baking.or i can use baking powder.because i always use baking powder. and if i use bw then how much quantity of it as compared to baking soda. i thing more baking soda too MAKE THE THINGS BLACKER AFTER COOKING,I knew that. but do reply with baking powder. Thanks for ur wonderful recipe of eggless date cake.I never prepared cakes till now.This is my first cake,I prepared this for my hubby’s birthday.He loved it really. Keep posting egg less cakes more and still more veg dishes. i tried this cake and the taste was simply superb…i modified the measurement slightly to get the right consistency…..thank u for such a lovely recipe. I tried this cake ..it was really good tastewise but it became quite sticky..Is it bcoz of the quality of dates?? ..I used seedless dates so i didnt soak it in milk..
Can you please tell me what went wrong?? Shilpa: Did you use milk at all? This was my first attempt with baking. My entire household ( amma, bro and patti) were so excited about it. And more so, for it being eggless. I used the quantity given, and used a hand blender. The result was just amazing. I have a few queries. The oven i have is the old traditional kinds. The ones, with a iron rod on top and bottom and temprature in celcius. The cake tasted excellent, however the top crust was slightly burnt. Once I removed that, the cake was amazing and disappeared in a jiffy. Shilpa, Can we make a carro t cake in the similar manner? ya i did use milk like you suggested..Infact i used little more than what you mentioned.Coz the cake batter bacame very very thick…But still it became sticky..You think i should have added more milk then suggested ? ?To bring the cake batter to normal consistency?? I have tried your banana-carrot recipe ..It came out so well..It was awesome..Somehow this cake didnt come out as expected..
Shilpa: Ok, that may be the issue. Please remember, for baked items, you should follow the recipe EXACTLY. So you should not have changed the milk amount. If you see the comments, this recipe has worked well for hundreds of people, so follow the recipe as it is next time. For this cake, the batter is thick, but it turns out well after baking. Thanks alot for such healthy and nutritious sweet dish. I tried Date cake as per your receipe. It taste excellent, however i didn’t get spoongy cake as you showed in the picture. I don’t know what might have happened. I need your guidence so that next time I will make my kid smile. I tried this cake out y’day, it came out simply great.thanxs for sharing this recipe.i used medjool dates, n the cake turned out a bit too sweet. my suggestion- use less sugar if you have really sweet dates. to my 4 and 2 yr olds, the cake was just yum-yum. this cake tastes awesome.i used ghee instead oil & it tastes good…….. I tried the cake again…Guess what, it turned out absolutely wonderful..I followed the recipe “EXACTLY”.Thanks once again for posting the recipe and your prompt response for my queries. The best cake i ever had.. I have made this cake 5 times and it tates delicious, but for reason, it always falls in the middle and is a little soggy. Can you offer some suggestions or tell me why you think this happens? Shilpa: You have to use fresh dates. Absolutely awesome …..had to let you know ….By popular demand, I had to bake it 4 times in a span of 3 weeks …. I tried this cake today. It’s wonderfull in taste. I used to make date n wallnut cake with butter n it used to take at least 30 minutes to mix everything. This cake is simple n taste same as I make it with butter. Great! U r doing great jobs for all of us, learners. I was surfing the web for some recipes and came across ur website. I read the Date cake recipe and found it very easy to make. I tried the cake yesterday without using oil. I baked it at 180oC for 40 mins. It Turned out tasty but was a bit hard at the top and bottom, inside it was soft. Is it because of not adding oil or the baking time? I use Kenstar Microwave oven and used it in Oven mode. Though it was hard, my husband and my 2 1/2 year daughter loved it very much. Thanks for posting delicious recipes. If I want to add a couple of recipes to ur website, shall I send it to you by mail or where can I post them. Please let me know. hi shilpa..i live in belfast(northernireland) i had tried many eggless cake receipes previously..but none were as good as urs..date cake turned out really well.iam planning to make it for my daughters 3rd birthday..
Hi Shilpa, Thanks a lot for sharing this very simple and nice cake recipe… whenever I bake this, I get a lot many nice compliments 🙂 Thanks a lot again…. I tried this cake yesterday. Infact twice, as the first lot got over within minutes. And 5 pieces from the second lot is let back. Thank you verymuch for this excellent recipie. It came out soft and yummy. Hi, can we bake this in microwave also. if so, for how long . pls specify. I cant express how excited I am after preparing this cake. I have prepared couple of other walnut and date cake, but I must say this is the “Best”. Thanks a lot for the recipe. Shilpa: Next time, keep it on the middle rack of oven. i’ve been tryin to get a proper eggless cake fa de past one yr…my aunt told bt this site and i tried this date cake and it turned out to be so yummy n wonderful…thanks a lot….plz keep posting more eggless cake recipies…. I tried your Date Cake recipe last evening. Absuloutely delicious. Your Pachi’s discovery is truly fantastic. this cake was a hit with my friends.it was very good.the best part was despite being eggless it was moist.i didn’t feel the need to add butter at all. Can this cake be prepared in a microve? or an oven is only needed?? i have a microwave at home…plz do tell the temperatures to be set. i don know much …as i m very new to cooking..jus a beginner. Shilpa: Please check comment #266. Hey, thanks for the quick reply Shilpa.. But the temperature at what she baked (comment # 266) is not mentioned. She has baked for only 5 mins. I will really appreciate if i get the temperature at what to bake in a microwave. Shilpa: Leena, I have never baked this cake in microwave. I would suggest you to give it a try and see how it works out. I have no idea about temperatures. I made this cake yesterday and it was just yummy. I can’t believe that such simple steps to bake a cake could lead to such a fabulous cake. thanx for ur recipe.i become a famous baker in my in-laws house in india . thanx for making me so famous. Tried this today. Came out very good. Added a pinch of salt and chopped dried apricots. The cake came out pretty dark on the inside too. May be if we add the golden colored appricots (and reduce the amount of dates) when grinding, the color might be more pleasant on the inside. Thanks for sharing this recipe. Hi shilpa…I tried this cake today with mejdool dates. I used the same quantity that you have mentioned .However the cake turned out too very sweet after completly baking……issit becoz of the dates? How can I predict the sweetness of the cake next time. the method of making it is same in oven or in microwave??? Looks like a very easy recipe. I am going to try using an egg in it tho. Love the details you have given in your cake recepie, I am surely gonna try it out and i believe it will be as yummy as it looks….Are you folks into barkey things, can i get few more recepies from you…God Bless You. I made this cake last weekend and it was AWESOME! My folks just LOVED it! Thanks a again for all the wonderful recipes! thanks for the recipe…….came out perfect….my frnd loved it….spreading the cake fever……. It came out well. Rather than a cake it came out more like a bread cake. My 3 year old who used to laugh whenever I offered him my baked goods – asked for the cake and ate a couple of pieces. Baked this cake on microwave. Samsung at 800 power setting for 5 minutes. Left it standing for 15 minutes. Sorry , tried out the cake n I felt that this is the worst cake that I have ever tasted.The cake lacked flavour n none liked it. I substituted soymilk for milk, sunflower seeds for nuts and used 1/4 cup oil and 1/4 cup apple sauce to make it 1/2 cup. Still in the oven…but smells nice. Hopefully it’ll taste as good as it smells. Hi … i tried this recipe today and til i cut it looked just like your images but no one at home liked it….it just didnt have a good taste… also it taste more like bread than cake……I followed your instruction sincerely but all vain…now i will have to eat it like bread :(((( Sorry not blaming u but than wonder what went wrong…..It was the first time I made a cake n my friends didnt even eat it properly and they were simply saying its good but I know they didnt like it as whenever I make something they just ask for more and with this cake they didnt even finish the firs piece properly. I am an avid reader of your blog…and have tried out a few recipes. Date cake is my personal favorite! Would like to share that I tried making the cake with a little variation by adding “wheat flour” instead of maida and the result was still yummy!! Thanks for this recipe. Tried this cake recipe about two years ago for a friend’s baby shower party. She had requested me to bake an eggless cake and after endless searches on the internet found this. It turned out so perfect that I did start the cake fever. Wherever I move go around the world, I never fail to contaminate people with this fever! Right now, I am in the middle east and we get excellent dates here. Tried it with slightly raw dates and it tasted good too. I have tried it with wholewheat flour, olive oil and no sugar (the dates were very sweet). Good to eat and good for health. yummy ,it turned out great. Hi.. one question….is i am not soaking the date as i will be using seedless dates … do i need to make paste using whole 3/4 cup milk or there is difference in he qty? please clarify ….thanks…. Yes, you still have to use same quantity. Thanks for ur reply… I am going to bake it now… hope it turns out good…. Keep it on a bit lower temperature ,on the middle rack and try. Thanks for the quick reply…. I will keep this in mind next time which will be very soon… though this date cake tasted very good…. everyone in my family loved it…. thanks for sharing this recipe….. I tried this cake in Australia in the oven it turn out good. After coming back to India I am trying in conventional oven. When I bake it for intial 1 to 2 hrs it’s like proper cake then later it will taste as half cooked and sticky. Can you please suggest me how can I get it properly? 1-2hrs?? I think the oven is not getting heated properly. Hi Shilpa, I tried this cake last week and it came out extremely well. I tried a vegan version using soy milk instead of dairy milk and it tasted awesome. I’m going to blog about it shortly. Thank you so much for this very simple yet tasty recipe. Tomorrow is my husband’s birthday and I am going to bake this cake for him. Can you please tell me the measurement of the cup and spoon which you use for this recipe? Is 1 cup = 200ml? i’ve lg microwave.how to bake a cake in it.i dont know to bake it at grill,micro or combi.and at what power.plz help. Please refer the manual of microwave. Some of my readers said they just microwaved it on high for 6-7 mins (I don’t remember the time exactly, so keep a close eye on it). Can I use the soda that I use in dokla, pakoda etc? Hi Shilpa..hwz u? Just to let u know have lost count wrt how many times I bakes this beauty but alws got gr8 feedback frm who ever tasted these! I hv extremely wet/moist dates here so adding 1/2 t of bak pwder gave a fluffiness to the cake. This was additional. Take care bye. I just had to write in and let you know how delicious and moist this cake comes out everytime I make it! THANK YOU for sharing this! 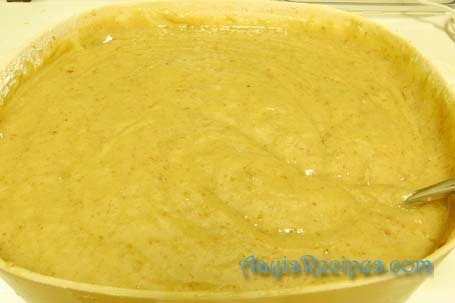 Today, I substituted 1/2 cup oil with 1/2 cup applesauce and reduced the sugar from 3/4th to 1/2 cup. Further, I toasted a good amount of walnuts and almonds, coarsely ground them and added it to the mix. Last but not least I baked it in a bread pan. Viola! I have a wonderfully moist, delicious and healthy loaf of a date cake! Wondering if there is a way to ascertain the calories on your recipe? did you ever try this cake with eggs, would it mess it up? How many eggs should I use if I can make it sith eggs? I have a date spread that I wanted to use for this recepie. Any idea how I should use that as far as measurments and method? I just gave it a go, I used butter instead of oil and the spear instead of having to grind whole dates. I used less sugar since the date spread had sugar in it. It came out owesome! I used Swiss marange frosting which I also added some of the date spread to and made a five layered cake with filling for my decorated sculpted cake. Thanks so much for the recepie I will try it again for sure. I baked this cake with splenda for my dad-in-law and he loved it! thnx! I have been making this cake for the last 6-8 months and anyone who ate has asked for the recipe. thank you for putting this up. Your website is deliciously superb. I have lost count of the number of recipes I have tried, almost all have turned out great. Could you post a simple reciple for homemade bread? I substituted brown (demerara) sugar for this recipe and it gave a wonderful flavor to the cake. Keep up the great work, wonder how you get the time…. milk helps in grinding dates. I don’t soak overnight, I just heat the milk and dates for few minutes and it softens them and makes it easy to grind. Thanks a lot for this wonderful recipe…came out really well.I baked it in a microwave and it came out nice,soft and fluffy.I used the convention mode at 180 degrees for 15 minutes.also preheated for 10 minutes in the same conditions..I want to try the same recipe using ghee instead of oil…thank you so much! If I do not have oven at home, what can I make date cake and any ather cake at home? You can make the cake in cooker. 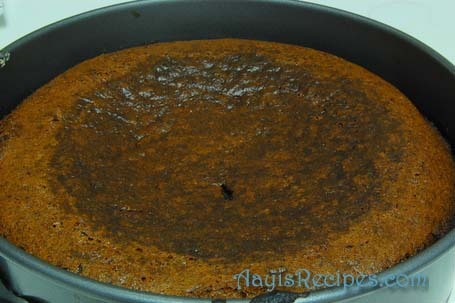 http://versatilekitchen.blogspot.com/2009/11/date-cake-with-coconut.html if you want to look at. tanq for the wonderful receipy.i triedout the same with whole wheat flour.the taste is excellent .i made the same in muffin mould in microwave.i microwaved at 3 min at 600MW power.the muffins cameout moist n yummy.thankyou. I tried this recipe many times now. Everyone in my family loves this cake. Last time i baked this cake was for my son’s b’day since we were not allowed to eat egg. I was very nervous because we invited lot of friends for a party but it came out really well. Last time i just made small change. Instead of oil i used unsalted butter & it came out heavenly delicious. looking for more eggless baking recipes. Some of the readers used soy milk and they said it came out well. I have always tried it with normal milk. Thanks for the wonderful recipe!!! I tried it out for the first time and it tasted awesome. But I was unable to invert the cake. Please let me know, how long should I allow the cake to cool before inverting??? Wait till the cake comes to room temperature. Tried it out today…came out awesome ! Thanks ! I am really happy to have come across your blog.I have prepared lots of dishes from this blog and liked them all..However the date cake was a different story.The first time it was like date halwa…and i thought thats ok…may be dats supposed to be the cake!! However all these comments for this single recipe kept telling me its possible to make a proper eggless cake..I tried again and again and again…yes i made 7 flop date cakes…but i just couldnt give up…did endless search on the net for eggless cakes…because my cakes used to look perfect from outside,but inside it was uncooked.sometimes the upper crust would be over burnt and the inner layers…well lets say it was nthing near to a cakeLOL! and i am so happy to say that i baked the most perfct date cake..
i feel so happy..I used convection mode of my IFB microwave.I preheated at 180 degree celcius for 10 minuters then baked the first ten minutes at the same temperature and then lowered the temperature to 110 degree celcius and baked for 25 minutes..it worked! I like to try this receipe, But I can’t understand the cup measurement. Could you please sent me the email with the measurements in grams even Dates (seedless). I’ve always wanted to try dates cake,but i knew that it won’t be easy and to get the good taste,i’ll need more experiance. Therefore i never tried to make a dates cake till i found ur receipe. It’s the best easiest receipe i ever found and today i baked it for the second time and the cake is sooooooooooooo amazing. But i finished it all 😉 and last night i wanted to try it again by soaking the dates so i soaked it for a night. This morning i baked the cake and it was great…..
Only one thing i found is that my batter wasn’t watery like urs. it was more like a muffin batter. But anyways the cake was delicious so i can’t complain. my husband found it a bit sweet so next time i wanna try to put less sugar and also wanted try this receipe without the oil. This is the easiest/tasty receipe and i’m sure anyone can do it. This is such a wonderful recipe…I just baked this cake and trust me I didn’t expect it would turn out so well and tasty. Though I put walnuts instead of cashew and used 1/2 cup each of milk and sugar. Remember to roast the walnuts a little.Essence can also be added. I tried this cake the first time and though it came out moist, it wasn’t very spongy. It was also a little too sweet (probably the dates I had were very sweet). The next time I baked this, I added one egg (along with the dates, milk and sugar in the blender). I also added spice powder (2 cloves, 1 inch of cinnamon and a tiny bit of nutmeg powdered with 2 tsp sugar). Also added tutti fruity and chopped cashews in the dry flour + soda mixture. Reduced the sugar to 1/2 cup. The taste was very close to that of a plum cake (xmas cake) and didn’t take more than 1/2 hour for preparation…yummy.. I liked the recipe and i want to try this right now………..because i like plum cakes very much basically…….let you know if it comes out good for me………keep posting recipes like this……Thanks for all that ! Thanks A Bunch…..I made this cake and it came out excellent for me !!! And i took so many compliments from my family and friends……credit goes to you………Hearty Thanks once again. Have u ever tried to double the ingredients? Am trying to make a bigger cake and want to be sure it comes out well, else I will bake it in 2 batches. I’ve been a silent reader of your blog for quite a while now. And yesterday I tried this recipe..It was unbelievably delicious..!!! I couldn’t stop eating it..!!! Tried ur date cake yesterday and it was awesome.NO ONE COULD BELIEVE THAT IT WAS DATE CAKE.my son thought it is a choclate cake and I let him believe that since he doesn’t like dates nor any fruits. sice I am atotal foodie person ur blog is a boon for me.I spend almost 3 to 4 hrs going thro’ ur recipes and reading comments.I amgoing to try every recipe of yours and let u know . This cake came out perfect…followed your recipe word by word and it was great…so soft and the rich flavor of dates….thanks a ton..! I tried your cake and indeed it started the cake fever.. I have linked your site in my blog.. I baked his yesterday for my 10th month old daughter’s monthly Bday. It came out awesome. taste was superb. I tried this recipe yesterday. It came out very well. Just loved it. I reduced the sugar and oil quantity. It was soooo tasty. This is th first time I really baked to perfection. My husband and son just loved it. Thanks for the recipe. Have a nice day. I just did it exactly like you had said and voila, it just turned out superb ! Soft, spongy and Yummy ! Best was my 3 year old son feasting on it right from the time he cut it ! Thank you ! one of my friend prepared this cake and ive become a fan of this!! i want to make this cake at any cost. i dont have a cake pan for baking, can i use the corningware bowl? it says it is oven safe, but is it safe to bake a cake for 30 mins? or can i use the regular baking tray? Sorry, I have no idea what is corningware bowl. You can use any oven safe dish to bake this. I newly bought a microwave convection oven. But i don’t know how to use it and make cakes in it. But now I’m very much attracted by ur recipe’s photographs. So, Surely at any cost, I tried this cake as early as possible. And i reply u soon. I stumbled upon your blog from Madhuram’s eggless baking blog. I made this cake for a religious festival a few days ago and it was such a divine offering. I’m sure you and your aunt will also get the blessings since recipe originated from your blog 🙂 I’ve already made it twice! I’m just learning how to bake eggless items, so wanted to confirm can the recipe be doubled/tripled as it is or are there any changes that need to be made? Thanks so much for your recipe and help! I tried the dates cake yesterday, its very simple and tasty. The first cake in my oven is came good. My husband and my son also like it very much. 1. My cakes recently rise beautifully in the oven at (200 celcius) till I take them out. Once I do, they fall and are dense and not fluffy anymore. Does it happen when the cake is not sufficiently baked? A toothpick came out clean with a few crumbs but the top wasn’t browned. 2. Do you recommend adding milk to cake recipes? An aunt who’s good at her cakes was horrified when I said I did. I am not sure about sunken cakes :(. Sorry. This cake needs milk. It is not added to all cakes. I have tried this cake multiple times and it always comes out real swell. Yesterday I made a small variation – added 1 egg and 1/2 tsp baking powder, reduced sugar a little. It was the yummiest and fluffiest cake ever. Loved it. Thanks so much for sharing this wonderful recipe. Tnk u tnk u tnk u tnk u tnx a lottttttttttttttttt….i am a silent visitor to ur site daily n never wrote on ur site uptil now …..i jus prepared as u said n it came out marvellous fantastic lovely never xpected such a cake since this is my first cake …….n u know i myself emptied the whole cake hmmmmmmmmm i cant forget the flavour toooo nice……tnk u shilpa…..i hav tried so many recipe frm ur site n uptil now all have come out very nice….tnk u shilpa i can say bcoz of u i have learnt cooking since i had jus married n din know even to prepare a tea also but now hmmm i can prepare any thing …..n most of my recipe is frm ur site only …..i hav told my other frds too abt this site….. I think this is your best recipe.I always try this recipe.We don’t eat dates but My husband & me both love this cake. Hi shilpa, loved this receipe..i just tried this and loved as it was not so sweet and the health conscious family really appreciated it..
Have been a silent reader for a while. I had tried your fruit cake a while back which was a huge hit. I had a few ‘eggless’ friends over yesterday night and tried the date recipe and it was delicious! Everyone loved the cake and it was over in a few minutes. Thanks very much for the recipe and the precise instructions. They were very useful as my time was short. Only comment I may have on the cake itself is that it was a tad sweeter – maybe due to the dates I used. Otherwise, it was amazing. Thanks again for the recipe and keep up the good work! I have tried this recipe,changed measures still it came out quiet well.Thanks. Shilpa, you are right about this cake causing a stir. I just tried it about 30 minutes back and couldn’t stop myself from blogging about it immediately. Thank you for sharing such a lovely recipe. Please do take a look at my post when u can. The recipe looks really good,which tells me to try soon. Can u tell me how make this with microvave oven with convention option.And i m having loaf pan can use to make this cake. Keep it in convention oven mode and bake. Hey Shilpa, this looks lovely, I’d like to try it, but with atta; I’m trying very hard to eradicate maida from my life! You have any suggestions on how to tweak this recipe for atta? Thanks! I haven’t tried it yet. Sorry. I think you can just replace maida in above recipe with atta and try. I have baked this date cake many times. I have followed ur recipe religiously(this is very difficult for me, for I am not called mad scientist simply). One of these days i will succumb to the temptation of tweaking the recipe. Do I have ur permission to do so and most importantly write abt it? Love to Ishaan. How old is he now? Just to cover all the masala. I donâ€™t know exact measurements. please tell me how to make these cakes without microwave oven cos i dont have it right now……. Disaster result. Too much sugar. Doesn’t rise well at all – I can’t even cut the cake. Every piece sticks to another. The texture tastes like mushy dates soaked in heavy syrup. my cake turned out really well, all your recipes i tried so far are lovely and mouth watering! im sure the ones i havent tried will experience the same feeling….you are amazing! but i did add one egg to the date cake recipe, dont know what made me do that…. anyways, keep uploading recipes..wish u good luck! I tried this recipe out and I totally loved it. I added some pumpkin pie spice, cinnamon and nutmeg and used BUTTER instead of oil and HONEY instead of sugar and it turned out great. i dusted it with a bit of powdered sugar and i just love it! Do you think it would be nice if I add little bit of cardamon powder? Can I make this in microwave, I have made it in oven for like thousand times now. Everyone seem to love it. I have moved to korea and now we have only microwave. I am missing my date cake. I specially carried dates from India for this.